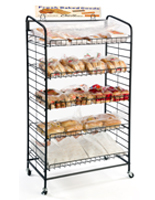 This bakery cart is an ideal store fixture for supermarkets, gourmet shops, and cafes that make or sell baked goods. 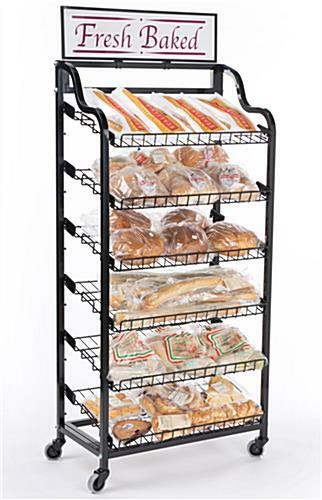 This piece of retail equipment holds and displays fresh bread, rolls, baguettes, cakes, pies, muffins, donuts, bagels, and more. 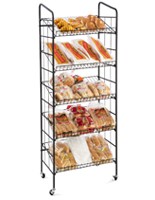 Each bakery cart that is for stores promotes these foods on (6) shelves that are made of wire. These trays are adjustable and can be tilted to either lay flat or angled. 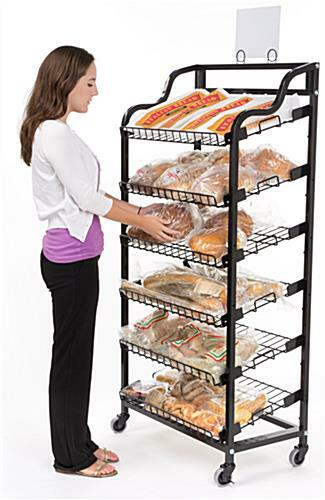 This bakers rack, bakery cart prominently displays food items using these slanted shelves. A small lip on the end of each shelf stops products from sliding out when the tray is angled. 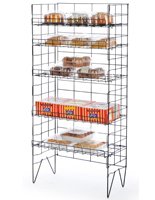 This bakery cart that has 6 shelves is constructed of steel, which causes the stand to be durable. This composition is ideal for busy shopping settings. 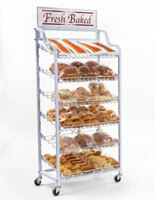 This bakery cart, also known as a bread display, features two sign holders that attach to the top of the stand. One sign frame comes with a premade banner reading “Fresh Baked”, however the frame may be used with any 37.25” x 7.75” sign. 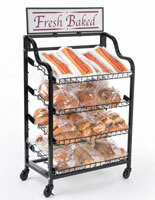 This bakery cart that has sign holders also has a display with a coil type design that can accommodate many sizes of marketing materials. 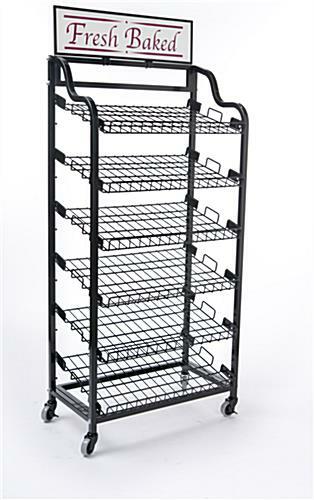 Each bread rack is equipped with locking caster wheels. 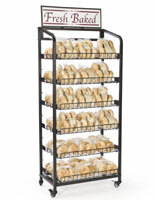 Each rolling bakery cart can be easily moved around shopping environments or brought into kitchens for replenishment, then locked in place so the stand is not jostled by customers. This food merchandising fixture is finished in powder coated black, allowing the display to coordinate with grocery store surroundings with ease. 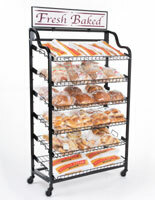 This wire bakery cart is great merchandising unit for stores selling baked goods! 30.5" x 64.0" x 18.8"
28.3" x 1.8" x 18.5"
Simple to assemble and solid display. Wheels roll very easily. That's what we like to hear, Tim! Thanks for shopping with us.